Many expats claim to struggle to find activities for chidren in Spain, that they really enjoy. Lots of children enjoy playing football in Spain. 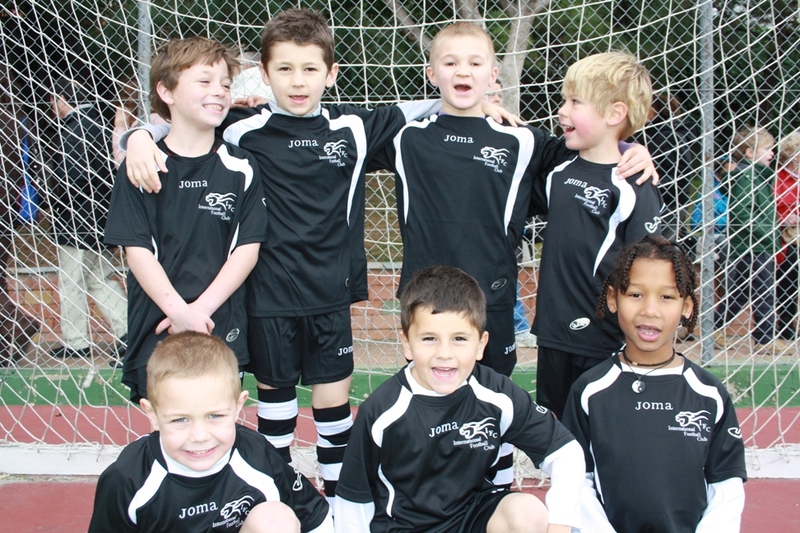 Yesterday, our son Joshua, played his first ever football match with IFC Benalmadena. This was the first match of the season and so expectations were not high. The club’s priorities are fun and enjoyment for the younger players, which in our opinion, is the way it should be. The boys met for a quick last minute training session, were issued with their new team strip and the were off to the venue. There was a bit of confusion over the match start times but the coach did a great job of keeping the boys under control, motivated and most importantly warm, on what was the coldest day we have had in Malaga, Southern Spain in a very long time. The team’s lack of experience was evident at the start as the rather grumpy referee had to continually show them how to perform small technicalities such as corner kicks, corners, throw ins etc. However, the boys soon picked it up. The first five minutes saw the team doing a lot of running …often in the wrong direction, defending and some great tackling … albeit of their own team members! All this resulted in a fumbled goal by the opposition. However, this marked the turning point. The pre Benjamin B’s became an unstoppable goal scoring machine. They were amazing! Santiago won almost every one of the uncountable number of tackles and he and Ryan made some fantastic breaks with the ball, setting up the goals. Jed was seen releasing his cannon ball kicks to clear the ball out of danger and into the opposition’s area. Thanks to great defending by Kiene, Joshua managed to keep out the few attempts on goal by the opposition. And Oliver scored four of the six goals! It was a great match to watch. The camaraderie between the boys was so evident. It is very early days, and this was their first ever match together, but these boys have the makings of a great team. Whether they continue to win their matches or not, they are, without doubt, going to have a lot of fun playing football in Spain together! Great job boys. Well done! My 18 year old was one of those referees and on cold days she might have been a grumpy one! However she used to love reffing Banjamin and pre Benjamin games because invariably something funny would happen and the kids generally just got on with the game however many they were getting thrashed by. It is one way for kids and even adults to earn a little extra in Spain as a ref. A course for a month or so and then an exam and matches. My daughter used to earn 40-60 Euros per Saturday morning. Not bad for something she enjoyed doing!